Veronica Mars is an outcast at her rich California high school after her best friend’s death. While solving mysteries with her private investigator father, she is also determined to figure out who killed her friend. This is a funny, well-written, suspenseful show with great characters and a “film noir” feel. I highly recommend this memoir written by Caroline Heller. She describes her parents stories of living in the cosmopolitan city of Prague before Hitler and the devastation World War II brought. Interwoven throughout the book are literature and poetry quotes which sustained her family through their darkest times. In 2009, Gourmet magazine suddenly closes its doors and Ruth faces a world with no job. 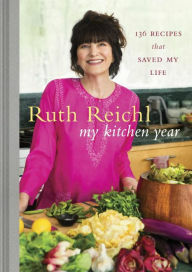 Part personal narrative, part cookbook, heal with Ruth as she turns to her favorite recipes and foods for the seasons. Beautifully illustrated, the book exudes warmth and cheer. Food therapy at its best! The author wrote this book as a letter to his son about what it means to be black in America. His words and ideas are valuable for every American regardless of race or politics. The author not only describes his personal experiences and feelings but also analyzes race in the broader context of American society and history. His powerful insights are the product of a brilliant mind. The audio is read by the author. I haven’t been so moved by a book since reading “A House in the Sky” by Amanda Lindhout.